Israeli musician and luthier Nir Cinamon has seen one too many metal guitars with skull and crossbones inlays and Motorhead stickers. It’s time to build a Jewish guitar, he thought to himself. Thus the Jolyrden Judaica guitar was born. They start life as quality “standard” guitars, and then receive the Klezmer finishes – inlays of beautiful Jewish motifs, such as the Star of David, ancient Hebrew coins, verses from Psalms - even the tremolo arm’s tip is shaped like a Torah pointer, crafted by a silversmith. 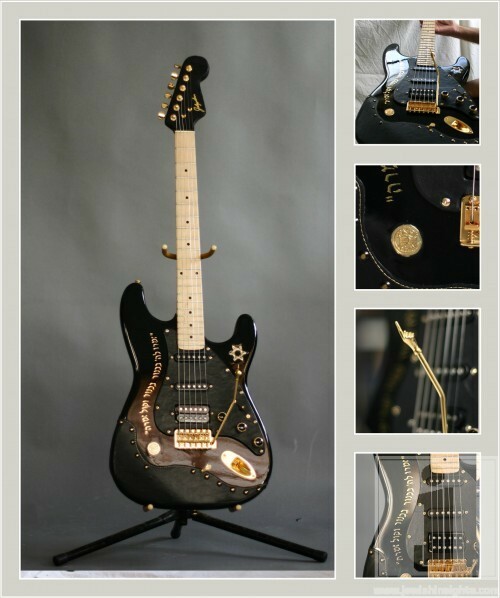 Jolyrden guitars are in essence custom guitars. Every one of them is built with the client, and can be tailored to his tastes – and beliefs. Since the appearance of a Jolyrden guitar on Eretz Nehederet, the Israeli equivalent of SNL, this amazing guitar has evoked interest among Jewish musicians. It seems like the market was waiting for something like this. Cinamon is now building in his Herzlia workshop prototypes for a new model, at this time a trade secret yet to be revealed.